Today, a lone telescope sits on the Moon’s surface. 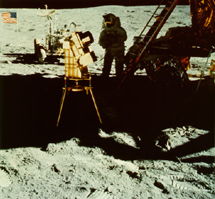 Astronaut Captain John Young operated Dr. George Carruthers’ 7.5-centimeter aperture lens electronic far-ultraviolet camera (telescope) during the NASA Apollo 16 mission of April 1972. Carruthers was an astronomer at the Naval Research Laboratory. Young used the instrument to photograph star clouds, nebulae and the Earth’s outermost atmosphere, or geocorona. The telescope was left behind when the crew returned to Earth. 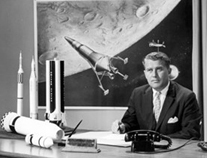 Before Apollo 16, observatories were included in many space visionaries’ initial lunar base concepts, including those of the legendary Dr. Wernher Von Braun. The first known lunar-based astronomy workshop was held in Falmouth , Massachusetts , USA , in 1965. In the USA , much attention was paid to lunar-based astronomy during the 1980s, especially following US President George H.W. Bush’s 1989 Space Exploration Initiative (SEI) announcement. ‘Future Astronomical Observatories on the Moon’ (NASA, 1988) and ‘A Lunar Far-side Very Low Frequency Array’ (NASA, 1989) are two examples of several important conferences that took place during this period. The American Institute of Physics 'Workshop on Astrophysics From the Moon’, held in Annapolis, Maryland on 5-7 February 1990, was attended by 120 experts who produced about sixty-eight papers on the subject. The event was somewhat of a culmination of American efforts to better understand and appreciate lunar-based astronomy. Many scientists had their horizons expanded and were able to “eclipse” their anti-lunar-based astronomy biases. However, with the failure to push through the SEI, the attention given to lunar-based astronomy and astrophysics decreased dramatically. In the 1990s, and through the 21st century, NASA maintained an odd period of lunar silence or neglect. However, several lunar-based astronomy advocates maintained their efforts. Dr. Peter Chen and Dr. Paul Lowman are among the most prominent of these persons. Dr. Chen is an expert on the concept of using multiple lightweight composite mirror telescopes to build robotic optical interferometers on the Moon linked by fiber optic cables. Despite their work and other efforts, no astronomy from the Moon mission has ever achieved realization.